The New Street /East Market St area needs to be broken down into a number of key elements to achieve a sensitive mixed use redevelopment which retains the historical character of the Old Town. By retaining public ownership of the land and buildings on East Market Street and undertaking basic maintenance and management, the existing Public and Common Good assets can become more economically productive and a continuous source of income for the Council. Alternatively the buildings could be put out to long term lease on the open market with a brief highlighting any necessary restoration works required and a range of acceptable future uses. The former vegetable market building is currently used as a car park for Council vehicles but has been identified as being surplus to requirements. This building and the Jeffrey St Arches have a lot of potential if a change of use to provide a range of flexible covered space was promoted (which can be used for workshop/storage, local and specialist markets, exhibitions, performance space as well as the provision of re-cycling facilities). Canongate Venture is a good quality school building which has provided affordable workshop and small business spaces since the 60’s. The continued use of this building for such uses would accord with the councils policy to ensure small industrial and business units which are self contained and do not conflict with residential amenity are retained to provide opportunities for local business. Alternatively the whole building could be put out for lease with conditions regarding the range of acceptable uses, thereby allowing an arts trust or similar community based organisation to undertake responsibility for the maintenance and management of the building. Improved pedestrian permeability can be achieved by re-opening existing pends and closes around the site and by the closure of Cranston Street to vehicles. Existing traffic management of New Street, Calton Road, and the Royal Mile needs to be reviewed to slow traffic and improve pedestrian safety. The former bus depot on New Street provides an opportunity to provide a significant level of family accommodation as well as housing for low income groups, the elderly and single professionals/key workers. These houses should also include low energy design solutions and discourage increased vehicular traffic by restricting private car parking provision and making provision for car club schemes. The layout of the buildings should reinforce the herring-bone pattern of the Canongate but allow for pedestrian links across the site, similar to the approach followed on Holyrood Road. The buildings should also reflect the topography of the Waverley Valley, being careful not to obscure important public views, and provide a mix of semi-private and public green spaces. A new public space/civic square could be provided beside the new Council HQ with a new entrance to Waverley station. 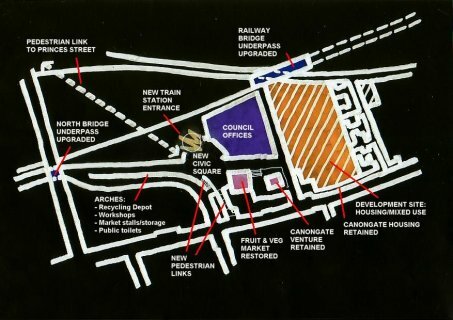 An exciting arts/market/cultural space which reflects the historical importance of the Old Town would be the first impression visitors would have when emerging from this side of the station.